The Hass avocado tree (Persea Americana Mill var. 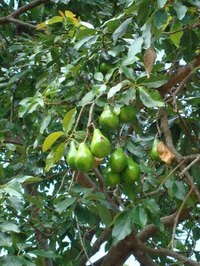 ‘Hass’) is a desirable fast-growing tree that produces high-quality, rough-skinned fruit with a long shelf life. The California Avocado Commission estimates that Hass avocados account for approximately 80 percent of the avocados consumed worldwide. Hass avocado trees are medium, spreading, evergreen trees that reaches 30 to 40 feet in height and 25 to 35 feet wide. Hass avocado trees have a symmetrical oval canopy that becomes increasingly open and rounded with age. Leaves are dark green, elliptic or oval in shape and 4 to 8 inches in length. Green flowers appear on the tree at the end of terminal panicles during the late winter between January and March. Thick-skinned, pear-shaped fruit appear soon after and ripen in the late summer or early fall. Avocado trees grow in full or partial sunlight. However, for optimal fruit production, plant Hass avocado trees in full sun away from competing canopy trees, tall structures or power lines. Avocado tree tolerate a wide range of soil types, with the exception of saline or poorly drained soil. Do not plant where standing water occurs. Flooded conditions can produce signs of nutrient deficiency, and reduced growth and fruit production. In addition, protect trees from strong wind, which may break the limbs of the tree. Hass avocado trees grow in USDA hardiness zones 9b through 11. These tropical plants are not cold hardy but will tolerate temperatures as low as 26 degrees Fahrenheit for brief periods. Avocado trees need warmer weather to support flowers, which appear on the tree between January and March. Hass avocado trees are ideal for the California climate. Over 85 percent of the commercially grown avocados in California are Hass avocados, reports the University of Illinois Extension. The Hass avocado is technically a single-seeded berry. It is surrounded by an edible yellow-green, buttery pulp. Avocados continue to grow, never softening, while on the tree. The fruit must be picked to ripen. Determining when to harvest avocados can be difficult. An avocado picked at the proper stage will ripen within about a week of being picked. Fruit that is picked prematurely will become rubbery and inedible. Hass avocados take up to 15 months to produce harvest-quality fruit.